This beautiful Asian kaftan borrows its name from the ornamental stone that is commonly used in Asian jewellery and decorative home wares. And just like the stone, the ‘Jade’ kaftan is truly beautiful and captivating. The bright and colourful design features shades of jade, blue, maroon and red. The handkerchief design allows for plenty of movement, flowing gracefully over the body. The beauty of the kaftan is its versatility. The ‘Jade’ Asian kaftan can be worn to an evening soirée, while relaxing in your home or on a trip to the beach. The sumptuous fabric feels soft against the skin and breathes easily in hot weather. No matter what shape or size you are, the ‘Jade’ kaftan will flatter your silhouette and make you feel glamorous. We deliver our fabulous Asian kaftans worldwide. BUY ONE FOR $99 ORDER NOW….. BEFORE MOTHERS DAY…..
SKU: 17-KF0017. Category: Designer Kaftans. 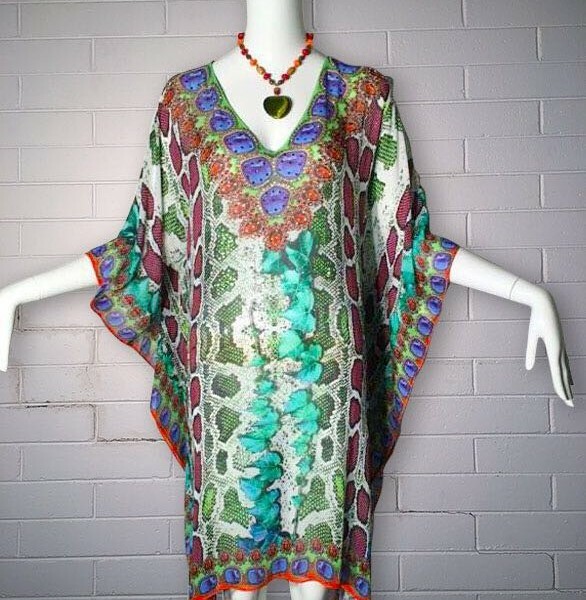 Tags: asian kaftan, buy cheap kaftans online, Buy Designer Kaftans Online Australia, buy kaftans australia, cheap kaftans, designer kaftans, indian kaftans, jade kaftan, kaftan online, kaftans, pretty porter kaftans. Copyright © 2019 Pretty Porter.